Liveaboard diving in February offers special highlights all over the world, especially for shark-lovers. In the Caribbean region, the Bahamas is known as one of the best countries to dive with sharks. The entire archipelago of 700 islands is a shark sanctuary, where fishing of sharks is completely prohibited. As a result, great shark diving opportunities can be found, as well as shark conservation and research stations. In the Indo-Pacific, Thailand is a great choice for February scuba diving. Whale sharks can be found in the Andaman Sea, an underwater gem bordered by Thailand and Myanmar which contains multiple national parks with remote archipelagos, jungle islands, and vibrant reefs. And for those who want a February dive trip with coral, biodiversity, and a range of marine life from macro to big pelagics, the all-time favorites of Raja Ampat and Komodo in Indonesia can’t be beaten. What to see in February? If you’re looking for toothy predators, head to the Bahamas for tiger sharks at world-famous dive site Tiger Beach. This is a notably reliable location to see the striped giants, as well as a huge array of other sharks. 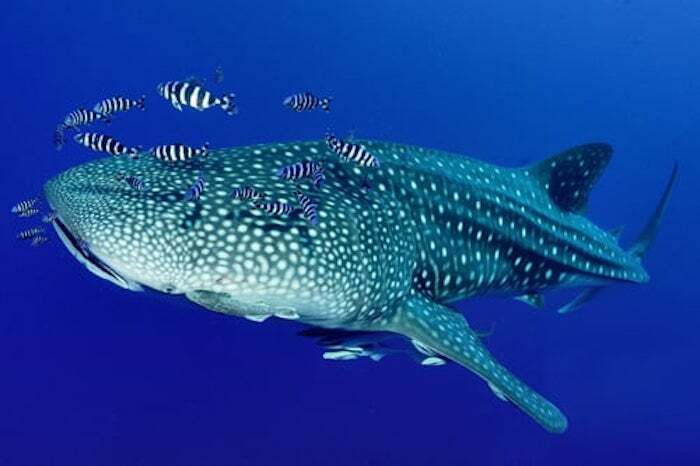 Divers who prefer a gentler shark should consider heading to Thailand for the beginning of whale shark season in the Andaman Sea, where the Similan Islands and neighboring seamounts like Richelieu Rock, Hin Daeng, and the Surin Islands enjoy the company of these enormous fish. Manta rays are also common in the Andaman Sea in February. In the archipelago of Raja Ampat, translated as “The Four Kings,” remote, western Indonesian jungle islands are surrounded with coral gardens full of strange and wonderful creatures; this area is considered the center of the center of marine biodiversity. If you’re set on seeing giants though, consider Komodo diving in February- the local waters have more plankton at this time of year, but this attracts more manta rays, so it’s worth going if mantas are your goal. Liveaboard diving in February in the Bahamas will undoubtedly include a visit to Tiger Beach, a dive site about 20 miles off the coast of Grand Bahama. Tiger Beach straddles the deep water drop-off of the open ocean to the east, an area washed by the Gulf Stream, and the shallows of the Caribbean Sea. Tigers and other shark species use both habitats, so Tiger Beach gets a lot of traffic. The dive site has a shallow, sandy bottom, ideal for a baited shark dive. Expect to sit comfortably on the bottom while the sharks are directed to the feeder- and swim straight past you. Other sharks which visit Tiger Beach include Caribbean reef sharks, huge lemon sharks, nurse sharks, and even great hammerheads; dolphins also hang around the area. February is a month which lies outside of hurricane season, so good weather is common, with a winter water temperature around 25-26 C / 77-79 F. Liveaboard diving in the Bahamas is also a great way to enjoy the diversity of the Bahamanian dive sites, with a mix of wrecks, reefs, and extensive cavern systems. Liveaboard diving in February is the perfect opportunity to see an iconic creature at an iconic dive site: the whale shark at Richelieu Rock. Richelieu Rock is a pinnacle between the Similan Islands and the Surin Islands off Thailand’s west coast. The February seas are flat, which makes it easy to visit this remote offshore site, and the whale sharks are joined by barracuda, big groupers, and macro-critters, completing the scale from the very large to the very small. A Similan Islands liveaboard will always include Richelieu Rock. Other Andaman whale shark locations which may be on the itinerary are Hin Daeng and Hin Muang, south of the Similans. Also nearby, Koh Bon and Koh Tachai are excellent for manta spotting. February falls in the dry season, which means warm water and great visibility. Whale Sharks in Thailand - photo courtesy of Manta Queen 8. February in Indonesia’s Raja Ampat falls in the high season when seas and skies are at their calmest. The diving here is colorful and vibrant with marine life- more than 500 species of coral support the legions of species specialized to tropical reef ecosystems. Waigeo, Misool, and Mansuar, 3 of Raja’s 1500 islands, are a photographer’s dream, with an unmatchable variety of nudibranchs and shrimp, some species of which haven’t even been named! For February liveaboard diving with large animals, Raja Ampat can also deliver: the area is home to a sizable dolphin population, blacktip and wobbegong sharks are plentiful, and mantas frequent Misool. For more manta rays, consider scuba diving in Komodo in February. This month doesn’t fall in the area’s high season, but if you’re set on mantas and you can find a trip, dive sites like Manta Alley and Manta Point offer high numbers of rays. For divers who love whales, Turks and Caicos are well worth a visit in February; this month marks the start of the mating and calving seasons of thousands of humpback whales off the coast. For coral-lovers, the Indo-Pacific archipelago of the Philippines offers plenty of great options. February in the Philippines sees good diving conditions on the southwest side of islands all around the country, which are sheltered from the seasonal northwest winds. If you’re feeling particularly adventurous, consider traveling off the beaten path in Southern Mozambique. 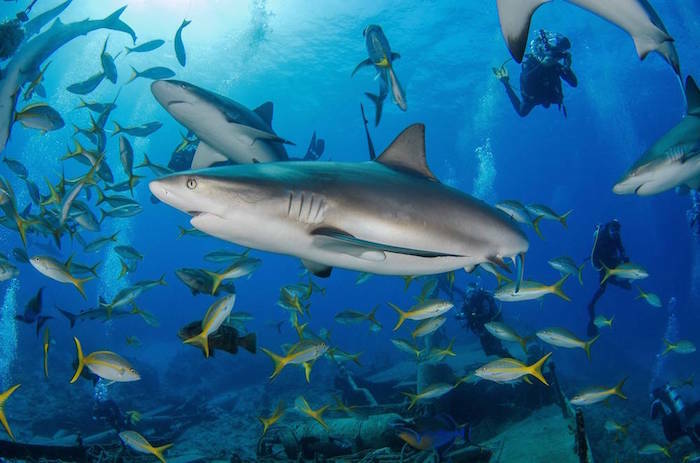 Some of the best clear-water bull shark diving can be found off Ponta do Ouro in February, as well as diving with hammerheads, blacktips, silkies, and over ten other shark species. Liveaboard diving in this area is still developing, serviced at this point mostly by specialized charters which are small-scale but luxurious.